Where Greece might appear to be a natural labyrinth within its cities and islands and their narrow passages that twist and turn, the formation of the Greek Key in its interlocking purposeful meander and cultural appreciation for the ancient mythology, ritual and lore. It is the origination of the story of Theseus championing the Minotaur of the maze and bringing to light the labyrinth out of the maze. Where the labyrinth seems to show up everywhere throughout the mainland and its islands, a modern society is forming and the labyrinth might prove to be a more useful mechanism for a variety of the requirements of society. South of the Islands that make up the space between Greece and Turkey lays the island of Crete. Discoveries and explorations are hoping to excavate an original Minoan Labyrinth in the cave complex of Gortyn, known as the Labyrinth Caves. There is also inquiry into the City of Skotino on the mainland as being a site with some reference that might bring into question the palace at Knossos. With time comes inquiry and investigation and in a culture that holds a distinct edge on Labyrinth lore, being open to exploration can only bring opportunity. 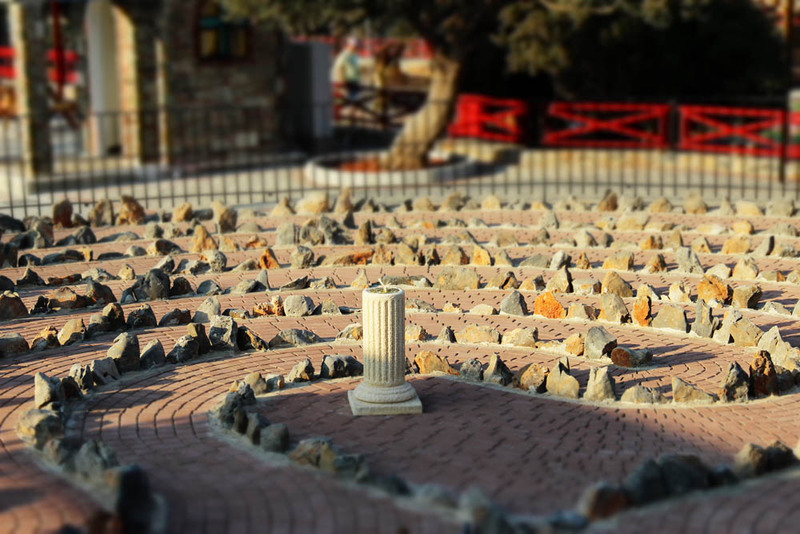 One such opportunity that is evolving young minds is the Labyrinth Park that opened in Hersonissos, on the Northwestern edge of Crete near the Agean Sea. It is a park of amusement and ecology, though its theme explains the myth of Theseus and the Minotaur. Where the largest attraction is the wooden maze, small walkable painted labyrinths dot the landscape, walkways and even the front entrance integrating the power of simple everyday importance over the larger draw of the maze. Opposite the area for Minoan Chess and the Cretan Village sits the large cretan stone bordered circular labyrinth design. When you can add natural simple activities to appreciate about the labyrinth among the normal entertainment children are bombarded with, a subtle education and an appreciation develops. For a culture that wants to retain values, finding ways to incorporate it into the mainstream with natural appreciation and/or application is a healthy direction for creating curiosity and education. Explore the ways in which you share your wisdom and knowledge to pass on worthwhile appreciation and education today.